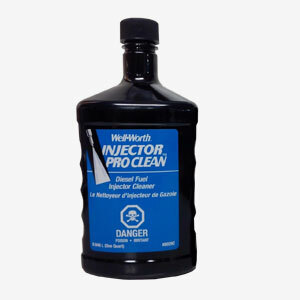 It is Rare in this Over-Hyped marketplace to find a product that actually works, but Injector Pro Clean has made a believer out of me, the very first time I used it. If you have a Noisy Injector, Pulsing RPM's at Idle, Smoke at Start Up, Drop In Mileage, Overhaul Poor Performance, and maybe you even took your diesel to the shop and they ran a balance test....before you order new injectors and spend $$$$, try Injector Pro Clean first! I had every symptom above on my 2004.5 Duramax LLY with 240,000 with original injectors and pump. I located the two bad injectors, and was ready to place the order, when I discovered a video about Injector Pro Clean. But I also have to tell you, I did not follow the directions on the bottle, I followed the video instructions. I bought a new Fuel Filter, and filled it with Injector Pro Clean, re-installed the filter, poured the remaining bottle into the fuel tank, I had 10 gallons of fuel in the tank. I started it up and it chugged and smoked, I ran it at 1200 RPM until it cleared up, WOW, and immediate difference. Then I drove it a couple hundred miles until I needed to fill the tank, then filled it up and added the second Well-Worth product, One 4 All as directed on the bottle. I continued to treat with All 4 One until the quart which treats 250 gallons was gone. Every time I drove my truck, the performance continued to improve, and the injector knock is completely gone. I would recommend that you purchase enough Injector Pro Clean to fill all your fuel filters, and add the One 4 All to your order.